ASK TOBY THE SAPIENT PIG – WHAT IS HAPPENING TO OLEG DERIPASKA? WHAT NEXT FOR RUSAL? Question for Toby: has the Hong Kong Stock Exchange rejected the share listing application by United Company Rusal? For at least two months the Hong Kong Stock Exchange and its listing division, and in parallel the state regulator, the Securities and Futures Commission (SFC) have been studying the proposal for listing and sale of shares by United Company Rusal, the first Russian company to attempt to list in the China market. Although the exchange and the commission don’t explain their action in individual cases, it is now plain that they could not agree to approve the listing in several sessions of the 28-member listing committee. The reports of their meetings – on November 19, 26, December 3 and 7 – have been cryptic, with anonymous sources claiming different reasons for deferral and inaction, until now the negative outcome is obvious. At least one of the underwriters of Rusal’s initial public offering (IPO) of its shares had warned from the beginning that there was insufficient time for the share sale to be marketed effectively before the western and Chinese New Year holidays; and that market conditions for share sales in the Hong Kong market, and for an aluminium company in particular, were unfavourable for the valuation Rusal had been seeking. This holiday period for the markets is counted from one week before Christmas through February 14. Rusal’s controlling shareholder and chief executive, Oleg Deripaska, ignored the advice and pressed on regardless. He has now got his comeuppance. Question for Toby: how many shares were to be offered for sale, at what price, and to whom? Toby’s answer: 10%; less than $2 billion; the Russian government. Starting in 2001, Deripaska has signed obligations to his shareholding partners promising that if they trust him to manage their interests in Rusal, he will arrange a public market listing for the company’s stock, allowing them to sell out, or leverage their stock. These stakeholders include Michael Cherney (Mikhail Chernoy), Mikhail Prokhorov, Victor Vekselberg and Len Blavatnik (owners of SUAL before it merged with Rusal), and the Swiss trading company, Glencore. The deadline for listing several of these stakes has already expired; one, Cherney’s, is the focus of a UK High Court lawsuit against Deripaska, who is charged with defaulting on his March 2001 contract with Cherney. Prokhorov and the others have given Deripaska extensions of time. But after listing failures in London in 2007, Hong Kong and Shanghai in 2008, they are showing the same signs of impatience as Cherney. In the London Stock Exchange listing bid in mid-2007, about 20% of Rusal stock was proposed for sale. This time in Hong Kong, just 10% was the number – small enough, the underwriters thought, to attract a carefully selected investor market. Still, reluctance on the part of the market to buy even this caused the company valuation and share price to be cut below Deripaska’s targets. Prokhorov, for example, has been agreeable to swapping cash debts owed to him by Deripaska for a shrinking valuation of Rusal; in 2008 he and Deripaska agreed to a valuation of $51 billion for Rusal; last month they agreed on $30 billion. But at the same time, at least one of the underwriters was speaking of an estimate between $18 billion and $22 billion. In a recent negotiation with a Libyan investment fund, Rusal shares were offered at a price equivalent to a valuation of the company of $19 billion. Potential Chinese investors, including Rusal’s international rival Chinalco, the Chinese state aluminium company, have hinted they wouldn’t buy at any price. As the company valuation dropped in search of buyers, and buyers failed to put up their hands at any price, two Russian state banks – Vnesheconombank (VEB) and Sberbank – announced that they would buy Rusal shares to support the IPO. VEB said at first it would buy at least 3% of the target offering; later it said it would spend about $670 million. If the latter price was meant to cover 3% of the shares, that suggests a valuation of $22 billion for the company. Of course, if VEB was prepared to buy more shares for the same outlay, the Rusal valuation would drop accordingly. Sberbank didn’t announce how much of the remainder of 7% it would buy, and it won’t have to say so now. The point has been made, however, to the Hong Kong Exchange – the only buyer for Rusal at the proposed listing appeared to be the Russian state. From the Hong Kong perspective, that means the share transaction proposed in Rusal’s prospectus isn’t the one applied for. Who really controls the company is one obvious question that the prospectus no longer answers – and the exchange is bound to ask again. Another obvious question required to be asked by market regulators on behalf of investors is whether the Russian state banks have quietly agreed to buy at a valuation of Rusal that is equal to, or not much above, the level of the company’s liabilities. If that might be counted as a form of bankruptcy action by another name, then the question the Hong Kong Exchange has asked for time-out to consider is: are all investors and shareholders in Rusal legally and practically equal? Question for Toby: does it matter if there is a listing delay? At a meeting at the Financial Times office in London last week, Deripaska gathered three reporters to his feet, and told them that if the Hong Kong Exchange delayed authorizing the share sale until next year: “No problem. We have very good cash flow.” Since Rusal remains the most private company in Russia, and also the country’s biggest debtor, it is unclear what balance sheet calculations Deripaska was talking about, or how the profit and loss lines are affected by the terms of the $17 billion debt restructuring agreement he has negotiated with foreign lenders and Russian state banks. He implied to the reporters that Rusal’s cashflow is not pledged for repayments, at least not in the short run. The implication is that the company can wait comfortably until next March before trying to sell its shares in Hong Kong, because the proceeds of the share sale aren’t immediately required for repayment to the company’s creditors, or for securing the value of the assets taken by the banks. From a sapient pig’s perspective, this begs the question of why Deripaska pushed so hard to list his shares in the Hong Kong market by this week’s deadline. The answer to that one appears to be that Deripaska himself fears the further delay, and what may happen in the interval between western, Russian and Chinese New Year. According to the Financial Times, Deripaska has managed the feat of negotiating favourable terms for a $17 billion debt without explaining or accepting responsibility himself for his company’s financial collapse; and without relinquishing personal control of the company’s forward administration. “Who should control the company?” Deripaska has asked rhetorically, as if there is currently no alternative. Toby suspects this may not be as obvious over the next twelve weeks – and Deripaska already knows it. Question for Toby: what can happen next? Toby’s answer: Cherney’s claim will go to trial in London — and soon. The first remark was an imprudent aspersion on the quality of the English judges who have been poring through Deripaska’s evidence for two years already. The second remark is Deripaska’s first hint that if the court rules in Cherney’s favour; or if, even earlier, Deripaska agrees to settle out of court with Cherney, this should not affect the future value of Rusal. In the meantime, since Deripaska is the controlling shareholder (in combination with the Russian state banks), and the chief operating officer of the company, his liability to Cherney is the acid test of his acceptability to other shareholders. It is clear in retrospect that one of the problems for the Hong Kong regulators, as it was for the Financial Services Authority at the London Stock Exchange two and half years ago, was the link between Cherney and Deripaska as founders of Rusal. Simply put, if Deripaska’s signature on Cherney’s share warrant is “crap” today, what of all the other signatures, share warrants, trusts, and covenants Deripaska has signed with international and Russian banks, co-shareholders, and contractors? Can the market trust him to honour them? Sapient though Toby’s brain is, his prudential reflex is located in another organ – his snout. In the Deripaska case, it never stops sniffing and snorting. Question for Toby: what can happen next, take-2? Toby’s answer: Rusal will be worth more to shareholders next March if the price of aluminium rises on sustainable demand; if the company’s revenues and earnings grow concomitantly; if no Russian challenge emerges to Deripaska personally; if he settles with Cherney; and if the Russian state takeover of Rusal behind Deripaska as nominee can be demonstrated not to threaten the secondary market in Rusal shares after IPO, nor the rights of minority shareholders who buy in. Even sapient pigs concede the difficulty of counting on four semi-divided trotters the supply and demand position for commodity aluminium in 2010. At the present moment, the spread between the cash delivery price of aluminium and the three-month forward delivery price on the London Metal Exchange is $2,107 per tonne to $2,138 – less than 2%. Notwithstanding, recent professional forecasts suggest that global aluminium demand will grow by 8% next year, while supply will gain by just half that rate, or 4%. The international surplus stocks of the metal are forecast to contract by 54% — from 2.6 million tonnes to 1.2 million tonnes. These numbers are good news, but they aren’t new news in the Hong Kong market. And so, if they failed to motivate potential Rusal sharebuyers since October, when the informal Rusal roadshow began, and when the IPO price might be at a discount to next year’s projected gain, then Rusal’s listing problem is arguably independent of the metal market as such, and of Rusal’s projected balance-sheet or operating performance. Toby suspects Deripaska of miscalculating. After all, why would it be any different for Rusal investors if Deripaska did not manage the company next year? Is his a contribution to the company’s solvency and profitability, or to the company’s risk discount? From those who have leaked what they have seen in the Hong Kong Exchange prospectus submitted by Rusal, Deripaska has proposed two Chinese guarantors of his credibility — Barry Cheung, chairman of the Hong Kong Mercantile Exchange, and Elsie Leung, a former Hong Kong official in charge of law and courts. Toby asks why prospective sharebuyers would not be more prudent to wait for Justice Clarke and the UK High Court to continue its two-year analysis of the evidence, and decide in Ms Leung’s place. 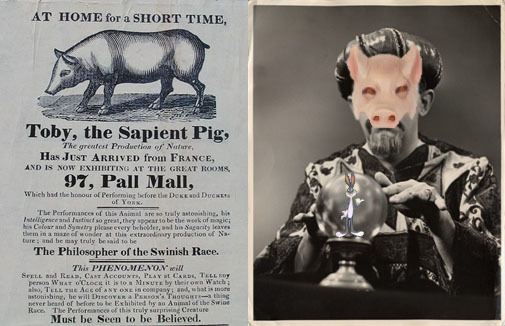 So the sapient pig returns to the point from which Rusal started in the spring of 2007, when it approached the LSE listing authority, and discussed with the regulators, as well as with the underwriters, the two risks everyone understood to be investment-grade at the time – Cherney’s claim, with the risk that the High Court would rule that Deripaska has been lying his head off; and the state claim on Rusal assets, with the risk of nationalization. Pig laughter can be misinterpreted, but Toby’s smile was unmistakeable when he read the opinion of one of the Hong Kong Exchange’s listing committee, who told the Financial Times that the delay of the IPO is nothing more than a little problem of literacy or eye-hand coordination. “I think,” the Listing Committee member said, “this is just about getting the listing documents in shape – it’s a huge prospectus.” Toby too understands how difficult it is read when a fellow is lying on the beach, tanning his nether parts, and the sand gets between the pages. Question for Toby – stop dithering, you pig! what’s your hunch of what will happen next? Toby’s answer: Deripaska’s survival in Russia depends on there seeming to be no alternative to his control of Rusal. There are three private shareholding partners who have reason to doubt and to challenge that – Cherney, Prokhorov, and Vekselberg (with Blavatnik). Deripaska has tried pacifiying the latter two; until this week’s rejection from Hong Kong, they seemed pacified. If ahead of a compelling court trial in London next April, Deripaska settles with Cherney, he may justify the outlay by counting that the listing valuation of Rusal would be lifted by at least as much as he pays out to Cherney, perhaps more. That in turn would add value to all the hardware, scrip, and promissory notes which Russian state officials and institutions are holding at the moment as Deripaska’s pledges to secure Rusal’s debt bailout. Settling with Cherney doesn’t resolve the nagging doubts that high government officials have that Deripaska might, in some hitherto unexplained way, be responsible for the Rusal mess. No official has aired so much as a hint of the related questions – where did the money go, and how much has Deripaska personally got left? The officials have been well motivated to keep their peace on these matters, so long as it has been the policy of the state that Rusal is too important to be allowed to fall into bankruptcy court; and that the best strategy for securing debt relief and asset stability is the listing option proposed by Deripaska. What Deripaska must do now, and for the next three months, is to neutralize all nagging doubts, every scintilla of suspicion, and the shadow of a leadership challenge. If Toby might be allowed the contemplation of a swinish irony, it is now in the Russian state’s interest to see Cherney paid out, and the prospect avoided of a High Court investigation of how Rusal has been operated, where the money has gone, etc. If Deripaska is to deliver value back to the state, as he has recently sworn to do, he must do exactly what Cherney has told the High Court he promised to do back in 2001 – protect Cherney’s stake from an unlawful takeover.